Welcome to the Virtual Education Resource Library (the Virtual Library). Users pay a fee for the privilege of using the Virtual Library, a fee that represents a twelve month access to valuable resources that are not found elsewhere. Access can be purchased by ISOPP members and non-members, with an enticing discount offered to members. Not a member? 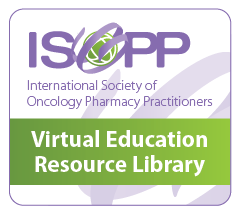 Join ISOPP and purchase a membership and Virtual Library access for close to the same cost or much less than the non-member access fee alone (dependent on the membership category). Symposium registrants: Complimentary access to the Symposium video presentations for which you were registered for up until the start of the next Symposium and for a maximum of one year. If you have paid for access or you registered for a Symposium and are logged in, you will see an abundance of resources below. If you have not yet purchased access, you will see a sample of the resources the Virtual Library offers. Please note not all presentations have been made available as requested by speakers. Search using a keyword or filter by subject, year, content type and file type. Plenary - Can We Afford Innovation in Oncology?